Occupancy rates are also projected to improve to 90% over 2019 and 2020. This chart from DBS shows that the monthly rents of factories, warehouses and business parks are expected to jump (ilang percent psf) in the next two years. Factory rents will be at $1.91 psf a month in 2021 from $1.89 in 2018, whilst warehouse rents could hit $1.80 psf a month from $1.73. Monthly rents in business parks may reach $4.71 psf from $4.44 in (what year). 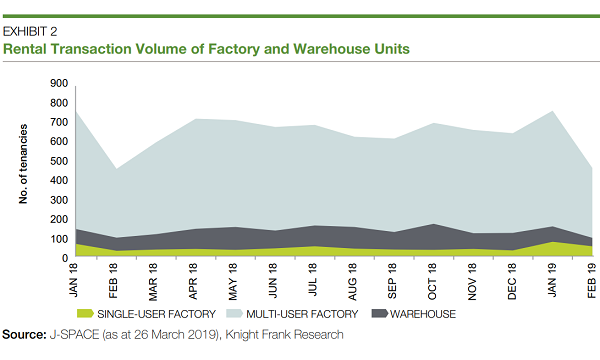 Rentals for the warehouse segments dropped slightly in 2018 and are forecasted to increase by 1% over the next two years. Occupancy rates are also projected to improve to 90% over 2019 and 2020. The business park segment faced a 3% increase in 2018 and may see a 2% rise in 2021. This rise is expected to continue as it is supported by a lack of supply completions. As for multi-user factories, rentals are expected to remain under pressure amidst an expected price increase of 1% by 2021. Occupancy rates are projected to drop to 86% in 2019 and to further drop to 84% in 2020. 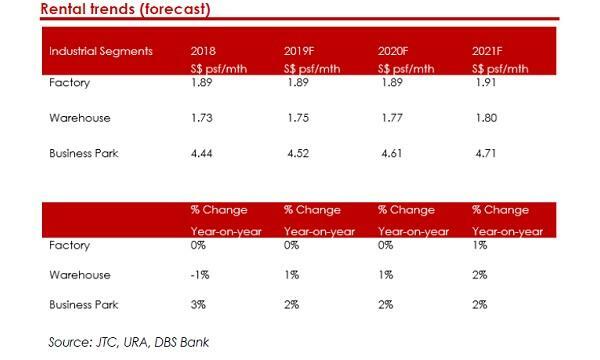 However, DBS noted that they are expected to pick up from 2021 as supply starts tapering off, where rental rates could rise.